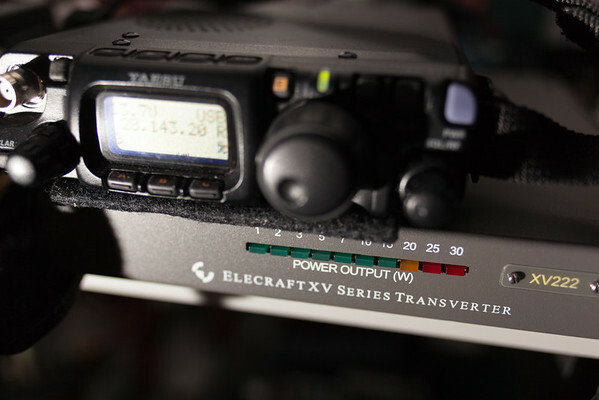 This is the weekend of the ARRL annual January VHF Sweepstakes. It is one of the many radio contests - this one is specific to VHF and higher frequencies. The idea here is to work as many other stations in as many different Maidenhead Grid Squares as possible over the contest weekend, which runs from 1900UTC on Saturday to 0300UTC on Monday. I made a total of 36 contacts - no, not anywhere near winning. Was just nice to get on the air. Biggest things from this weekend - found I could tune my old G5RV on 6m, after having changed out the old Balun for a newer one, and, got the XV222 transverter, pictured here with the FT-817nd "IF rig" working. This was pretty much the first chance I'd had to put it on the air and make some contacts. Was a fun build. I built the kit last fall. Am overall very pleased with the quality of the product and the experience I had building the kit. Had one mis-queue with the inductors (had 2 sets of them swapped in the position they needed to be on the board) but, with a bit of email support from an Elecraft Engineer, was able to get that sorted out and get things working. It is, based on today's experience, about 3kHz off - to work on 222.110mhz or 28.110MHz on the IF rig, I need to tune to about 222.112.90 or 28.112.90 on the IF. Could be worse. Photo was taken with the 5dII and the 28mm Zeiss lens. Flash, somewhat obviously, off to the left just a bit lower than the shelf on which the radio was sitting. ISO 100, 1/60th, f/4.0 - E-TTL full auto. Flash was gelled with 1/4CTO. Shot this with the ambient lights turned off - though there were a couple of computer monitors running.